K3/100 build and under the Christmas tree. I have the best wife in the entire world. 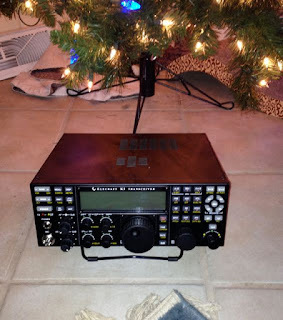 When it came time to make our Christmas lists this year, I had mentioned that it had been ten years since I bought my last ham transceiver -- I finished the KPA100 for the K2 in the fall of 2002. And while it might be time to look at something new, modern transceivers are not cheap. In the end, I decided to ask for contributions toward the "K3" fund -- money I would use to buy an Elecraft K3 at some point in the future. Before Christmas, my wife had hinted she had gotten me something expensive. She would tease me that she had purchased a Cessna 140 or a Harley-Davidson. She did it often enough I wasn't sure what to believe. 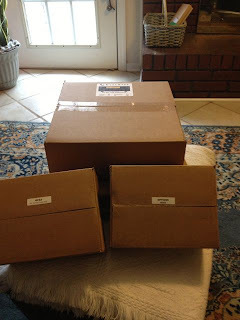 Inside these boxes is a bit of joy. However, due to some shipping difficulties, my present didn't arrive until three days after Christmas. Needless to say, I was surprised to open the box find a stock K3/100! She had the presence of mind to get me the unassembled version, instead of the factory-built. While it's a bit more work, I really enjoyed assembling my K2/100, so I figured I'd get some enjoyment out of this. Biggest problem, though, was where to build. The Micro-Shack is, well, micro. The entire desk surface is barely 5 by 2 1/2 feet. 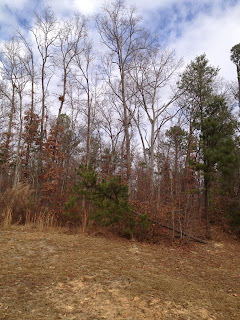 Most of my tools are still down at the QTH in Gwinnett county. Nevertheless, I figured I'd do what I could with what I had, rather than wait a week or so until I could get to my big workbench. K3/100 goes together on the world's smallest workbench. As it stands, I had enough room for the job. It was already late in the day when I got started, so I decided to forgo the Elecraft-recommended inventory. I've built a number of their kits, and I can't say I've ever been shorted a part. Indeed, they always seemed to ship me extras. In retrospect, this wasn't such a bad idea. If you've never built a kit before, inventorying the kit is a great idea. Since all the boards are pre-assembled, there's no need to warm up a soldering iron. However, there's plenty of mechanical assembly. I thought it was weird that Elecraft has one put the left and right side panels on, only to have you remove them a few steps later. I had never really seen the insides of a K3 before, and the pictures don't do it justice. In some ways, it really is like an over-sized K2, with the mechanical rigidity coming from the main board. Once you get the casing on, it's really pretty rugged. Assembly was pretty much a joy, except for the limited work space. I had a great sigh of relief the first time I powered the K3 on, since it was clear I hadn't messed it up somehow. I did have one item I did mess up during assembly. It was the KREF3 board. 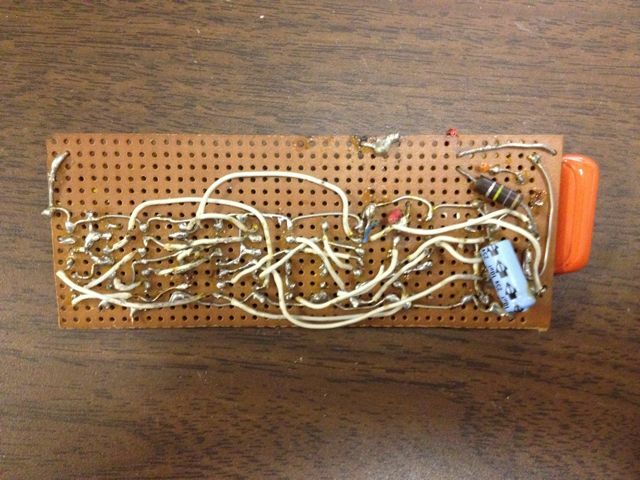 The instructions indicate you are to cut off any leads that might be longer than certain components on the board. I found a through-hole connector lead that I thought was a bit long, and when I tried to trim it, I also managed to bust capacitor C2 off the board. Fortunately, this component isn't used for anything critical. 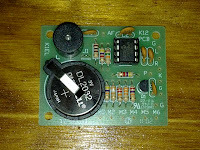 My guess is that it is used for FM only, but there's not really any documentation as to what the TXMIXFIL signal does. 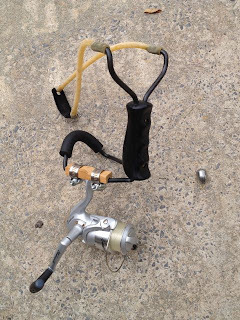 I've already contacted Elecraft support as to how they suggest we fix this. After about six hours of work, my K3/100 was all assembled and calibrated. I only ran into one issue -- I had no dummy load to perform the Transmitter Gain Calibration. I ended up doing the calibration manually using the antennas I have on hand. Not perfect perhaps, but it will do until I can get my hands on a dummy load. Now that it's assembled, I have to go an order the other options I need. Unfortunately, the KAT100 doesn't work with the K3. I went ahead and used some of that "K3 Fund" money and ordered the KAT3 antenna tuner as well as the KXV3A transverter adapter. That should do me for quite some time. Now, I need to sit back and read this thick operating manual so I know how to use my new rig! See you on the bands. Bowline - an extraordinarily useful knot. Anywhere you need a knot that won't slip, won't tighten down and is very strong. I use this one everywhere -- when tying ropes off to insulators, bringing wires through insulators, tying ropes to carabeaners, etc. If you learn no other knot, learn this one. Square Knot - Got two hanks of rope, neither of them long enough for the job, join them with a square knot. While it won't go though pulleys, it will go over branches with a tug our two. best way to join ropes of roughly the same size. Sheet Bend - so, how do you tie your hauling line to the fishing line you've managed to get over that tree? Square knot doesn't work so well when one end is a lot smaller than the other. The Sheet Bend is the answer. Just remember that the larger line gets the "U" and the smaller line is the "X". Taut-Line Hitch - need to adjust a rope to a modest tension, but don't want to keep re-tying? The Taunt-Line Hitch is perfect. You can slide this knot considerably to adjust tension. Just don't use it for anything structural, like guy wires, since it can slip down under enough tension. Two Half-Hitches - Have a free end of a rope you don't want to flap around loose? Two half-hitches is the choice. I often use it to secure the free end after a Sheet Bend. Clove Hitch - Be careful with this one. It works well if you tie to a fixed post that can't rotate. Don't try to use it to raise a mast or left a boom -- with a smooth rope it may turn and then come loose. Learn these knots inside, you'll want to have them memorized for when you are ready to use them out in the field or woods. Enjoy. These two rigs sit in my shack all year, but I really only use them on new year's day. 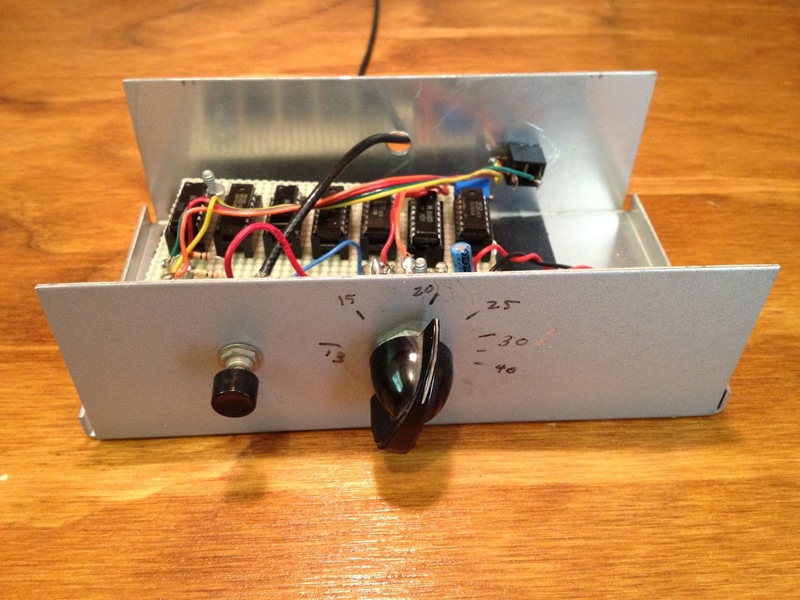 I'm talking about my home brew Novice Transmitter and Receiver. Practically speaking, the transmitter isn't terribly useful. Being crystal controlled, you can't hunt around the band and answer someone -- you must call CQ. And it only covers 40m. 40m is a great band, but not everything happens there. The receiver would be more practical to use -- it's a pretty nice superhet, with a narrow CW filter. But, really, it's designed for use with the transmitter, so it too, sits idle on the shelf. 2013 will be the seventh year I've operated Straight Key Night with this transmitter. Frankly, I'm considering cheating. 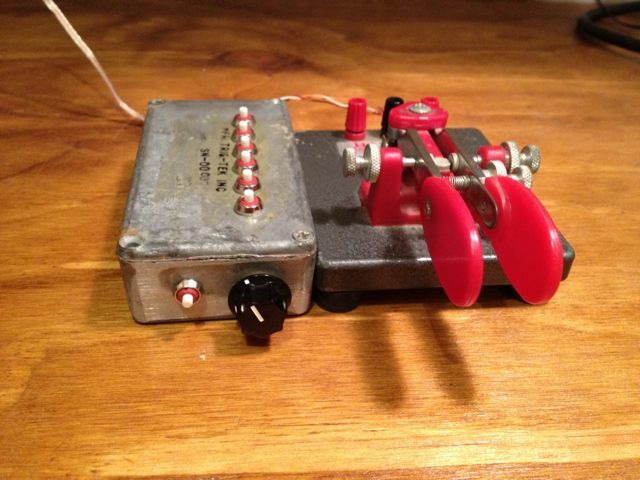 Instead of using my old Japanese J-38-style clone, I'm thinking of using the Mini-MOS keyer. The whole idea of Straight Key Night is to return to our roots. Why not use this over venerable equipment? I also wonder how the transmitter will sound being keyed electronically, instead of mechanically. If I do end up using the keyer, I'll have to disqualify myself. Back in 2001, when Gary Breed, K9AY, helped me to put up my tower, he suggested that I operate the ARRL 160m contest. My excuse at the time was that I had no antenna for 160m. His suggestion was simply to load up whatever I had, that this contest was an opportunity to make a lot of contacts without much of an antenna -- and, besides, it was a lot of fun. That year, I threw together an inverted L. It wasn't much more than 140 feet of THHN house wire, mounted to a simple particle board frame that could house a series variable capacitor. I ended up removing the series capacitor and just feeding it straight through. I only had wire and room for two 100 foot elevated radials that were about 40 degrees to each other. The inverted L never did work right that year, and I ended up using an 80m doublet about 10m off the ground for over 200 contacts. I never forgot that experience, and I have enjoyed the ARRL 160m contest many, many times since then. I eventually shunt-fed the tower. 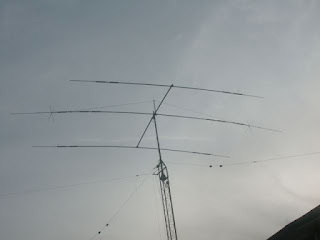 Over the years, I managed to work all states and over 25 countries on 160m. Out in Floyd county, I figured I had plenty of space to try out the inverted L again. It's taken a year, but I finally put it up, as you can see from the picture above. Or not. You see, it's about 200 feet up the hill going up about 60 feet into a red oak tree. The remaining 80 or so feet goes east through the woods to another tree. Even if you know where to look, it's hard to spot. Impossible, really. Putting down radials is more an exercise in finding wire. Copper has gotten very expensive. I bought a spool of 500 feet of 14 gauge THHN wire and cut it into quarters. ($45 at Home Depot! ouch) Then I drug the four wires into the woods. Bad idea. They ended up looking hopelessly tangled. No matter. I've been untangling wire and rope since I was 10 years old -- I have decades of experience. It took a while, but I rolled out the four radials roughly ninety degrees to each other. I fed the antenna with over 200 feet of the Wireman's best RG-8X, Certified 118. With only four radials, I did not expect much. The antenna isn't quite resonant in-band. My initial readings showed an SWR valley around 1860 kHz. A little high, but useable. Subsequent measurements from the shack show the low SWR is below 1750 kHz. All the coax makes the antenna broad -- just because of the line losses. (This stuff is rated at 1.5 dB loss per 100 feet at 30 MHz -- losses at 2 MHz can't be much more than 1 dB) For this years ARRL 160m, I just ignored the losses and used a tuner. My schedule only permitted me to operate for about four hours on the second night. This antenna was extremely effective. I could work just about anyone I could year, and calling CQ was reasonably effective. The most amazing thing about this antenna is how quiet it is. At first, I thought it might be due to all the coax and ground losses. But, since the antenna was so effective -- at least as effective as the shunt-fed tower, I've changed my mind. It's just really quiet out here in the country in Floyd county. My plan is to add more radials -- four more 125 footers ($45!) and eight of half that length ($45!) -- for a total of sixteen radials. 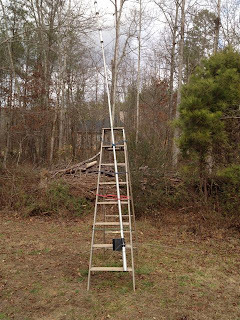 I also want to add a trap for 80m, and I'll worry about trimming the antenna to resonance at that time. Paul Thurrott wrote an article about the impending release of Windows 8, Windows RT and Surface. He's got one thing right, Microsoft has a problem. Apple and Google have gotten a big head start, and Microsoft is coming to the game late. Windows Phone 7, while technically interesting, hasn't gained any traction in the market. They are betting a lot on Windows 8. Windows RT is not a computer operating system. Windows RT is an operating system for mobile devices. Surface with Windows RT is not a computer. It is mobile computing device, like an iPad. It is a tablet, a hybrid device that bridges the gap between real PCs and media tablets, where you can work and play. Who came up with this "media tablet" name, anyway? As if devices like the iPad are only useful for consuming, not creating? It's the same journalists who have spent 20 years reporting on the personal computer market -- who have been focusing on the desktop for so long they can't see anything else. The computer marketplace has always been about change. We had huge mainframes at first, and then came the minicomputers. They weren't anything like the mainframes, and journalists didn't think they were computers, either. And just as these minicomputers started to build a big market, they came out with microcomputers. It's been a long time since we called them microcomputers. That's where the micro in Microsoft comes from. They weren't viewed as "real" computers either. And then they, too, took over the market. And those microcomputers have gotten smaller and smaller while at the same time getting more and more powerful. My iPhone 4S has more memory and computing power than the supercomputer I used at college 30 years ago. Why can't it be a "real" computer? Sure, an iPad doesn't look like former PCs. It's mostly screen and battery. But it's a natural evolution of the personal computer. There's no reason you can't use an iPad, or a device like it to do "real" computing. Indeed, the iPad is the new face of computing. Just like the microcomputer before replaced the minicomputer -- tablets like the iPad will replace the PC. It's just a matter of time. Delighted to find confirmations on LotW from HK0NA on Friday. Worked them back in late January and February on 160-10m, all three modes - CW, Phone, RTTY. It's a great feeling to go from not having a country confirmed at all, to having them confirmed on nine bands and three modes. Kudos to the DXpedition team for uploading to LotW so soon after the event. OK. At least I know what's wrong. It appears that one of the chips on the KPA100 fed by the 78L05 has failed and is drawing so much current that the regulator only puts out about 1 volt. It isn't U1 -- the PIC chip that runs the KPA100. That one is at least socketed and was easy to remove and test with it out of the circuit. And it isn't U3 -- the 78L05 regulator. I pulled it off the board and tested it, it works OK. Somehow, I hurt my back. Well, I say somehow, but I know how. I over-did it at karate. It's hard when a 51-year-old man tries to keep up with the teenagers. Too much jumping and kicking, and I ended up in so much pain the Thursday before Field Day that I could barely stand. 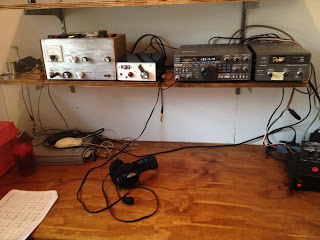 Fortunately, I managed to get it under control by Field Day and work some stations from the Micro-shack. I started by putting the 80/40m dipole back up. A rope had frayed in two where it went over a branch. An hour's worth of work and that end was once again up in the trees. I spent some time raising the other end and managed to get it a couple of meters higher. 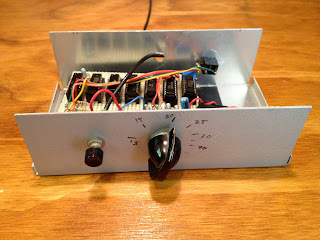 I used the Elecraft K2/100. The K2 is really designed for field day. It worked out really well. I borrowed a 12v deep-cycle battery from my camping trailer to operate class 1E. I did end up getting a Low Batt indication after about 3.5 hours, but I reduced power to 50 watts and continued one. Conditions weren't great. I found nothing on 10m, very little activity on 15, which means everything was crammed onto 20 and 40m. At one point, I could not find a clear frequency on 40m CW -- there were signals every 200-300 Hz. It almost sounded like 160m during the ARRL 160m contest. Managed to do a bit of running, but this one was mostly S & P. I must say that field day operating technique is significantly below the standard of most contests. There were several occasions where I was calling CQ, someone called, I answered, and they disappeared. It even happened a couple of times when someone else called CQ. I guess people got key (not mic) fright. Took one break to take my wife out to dinner. About 0300z, my back had had enough of sitting and I had to pull the plug. Maybe next time, I'll be able to stay up a bit later and work more on 80m. Two memorable contacts. Worked W4DOC -- the Atlanta Radio Club, with whom I have done innumerable field days. Also worked W8SP -- a club which my brother Ben, NJ8J, used to join for field day in WV. I had never worked W8SP before. Microsoft announced this week a new line of tablet computers running Windows. The announcement event had more than it's share of balky demos and unresponsive machines. The most curious thing, however, was the most distinctive feature of the Surface devices -- the embedded keyboard/cover. Although Microsoft had "hands-on" event, none of those present were actually permitted to try the keyboard. Add to this the fact that no pricing was announced and it just gives the entire event a forced feel -- like the products just weren't quite ready to announce. John Gruber has perhaps the best analysis of this: "I presume Microsoft timed this event to jump ahead of anything Google might be announcing at their I/O conference next week — and the consensus seems to be that Google is going to announce much the same idea: their own Google-branded, Google-designed tablet that will put them in direct competition not just with Apple but with their own OS licensees." Contrast this with Apple's announcement of the iPad. There were certainly plenty of rumours that Apple had been developing a tablet device. They had been circulating for years. In fact, the Apple rumour mill had gotten very tired of this story by the time of the announcement in January 2010. But Apple's announcement event was smooth and polished, full pricing information was given and pre-orders were taken within 60 days. There's no doubt that the iPad has been a complete breakthrough product. And despite a host of challengers introduced in the last two years, none have really made an impact. Currently, there is no "tablet" market. Not yet. There's only an iPad market. I welcome Surface, just as I've welcomed the other iPad competitors. Competition is a good thing. When Windows Phone Series 7 was introduced during PDC '10, I thought it was a good thing. Frankly, I'm disappointed that it hasn't done better in the market. It's natural for any market to have three or four strong competitors, all pushing each other to produce better and better products and more attractive prices. On this note, the personal computer market was a complete anomaly for over two decades. At first, it was dominated by the IBM PC. However, due to bad management, IBM had leaked enough technical details to allow their product to be copied, so the market became dominated with PC "clones." IBM tried to remedy this situation by introducing the Micro-channel Architecture, which required vendors to license certain technology in order to produce clones. (I fondly remember walking around COMDEX in the late 80's, finding some cool ISA hardware board, and then asking them if they had an MCA version available) But the market had already been wrested from IBM's hands, and placed in those of Microsoft, who's MS-DOS ran on all those clones. Microsoft leveraged that OS monopoly into another, with Windows. Soon Microsoft dictated the hardware requirements to the clone makers, and stifled any upstart OS that threatened to emerge. Sure, there were competitors, such as Apple, who made arguably better computers, but they held an insignificant portion of the market. But it didn't last. The problem with monopolies like this is they tend to stifle innovation. The best example is Microsoft itself -- with Internet Explorer. Microsoft recognized in late 1994 that the internet was a threat to their OS monopoly. They bought the Spyglass browser and turned it into Internet Explorer 1 in August 1995. There ensued a frenzy of innovation effort which brought us to IE 6 within six years. And then -- nothing for over five years. By 2001, Microsoft had achieved complete market dominance with an 85-90% market share in the browser space. Only when competition appeared again in the form of Mozilla and WebKit-based browsers did they again release new version of Internet Explorer. And, today, the browser market space is dominated by four strong competitors, each with 20-25% market share. That's a normal market. There's too many writers in the computer press who are used to the anomaly -- with one competitor completely dominating the market. After all, it makes their job eaiser. All they have to do is follow the market dominator. You'd think the press would embrace Apple's dominance in the tablet space. But no, it can't possibly be Apple. Apple was too long the beleaguered also-ran. By 1997, the press had given them up for dead. And there was certainly a lot of evidence for that. Apple proved it could successfully dominate the market with the iPod, another product many competitors tried unsuccessfully to compete with. Yet the press still looks to Microsoft. After Apple announced the iPhone, Palm's Ed Colligan said, "PC guys are not going to just figure this out. They're not going to just walk in." Of course, the funny thing is -- they did. And not just once with iPhone, but a second time with Android. There's always room, even in a crowded market, for innovative products. It's been eleven months since we got AT&T internet at the parsonage. At first, we ordered Comcast internet. They even sent us a modem. But there was this little problem of not actually having a cable plant out in the country where the parsonage is. They did finally quote us a price -- $5400 to install cable. No thanks. So, we were thankful to get 6 Mbps/.5 Mbps AT&T DSL. They installed the 2Wire 2701HG-B Modem/Router/Wireless access point. This has been OK, except for one nagging problem. Randomly, without warning, the router INTERNET indicator would go dark, the DSL indicator would go red and start blinking. Soon, the DSL indicator would turn to green blinking, then solid green, and the INTERNET indicator came back green. This takes 8-10 seconds, all the time the internet would be inaccessible. This might happen a couple of times a day, but more like twenty -- and more often, it seemed when someone was actively trying to use the internet. This was especially bad when I was using Skype or my cell phone (my microcell is connected through the same internet connection). Or if I was using a virtual private network connection (VPN) to my work computers. That disruption would reset the VPN connection, and I'd have to go through a ten step process to reconnect. Perhaps two minutes later, I could try to work again. At least until it tries to reset. Last weekend, I finally got tired of it. So I searched the web for information. Using some of the diagnostic pages inside the 2Wire router, I determined that the sequence of flashing lights represented a DSL Link Retrain. Those of you old enough to use analog modems will remember the distinctive sound of tones just before the modem connected. A DSL Link Retrain is much the same think -- only at 300 kHz instead of at audio frequencies. Further searching revealed several articles by those unimpressed with 2wire products. One of the options is simply to replace the router. Being a ham, I'm not one to want to rush out and spend money I don't have to. The AT&T Community Support forum unearthed an excellent thread: AT&T 2Wire 2701HG-B Disconnects / Drops. This had six pages of comments, and it took nearly an hour to read. One of the suggestions was to measure the throughput of the connection using SpeedTest.Net, in order to determine that the DSL line was provisioned correctly by the phone company. When I tried this, as soon as I hit the uplink test -- DSL Link Retrain. I tried it a half-dozen more times. Every time I hit the uplink test, the router would do a DSL Link Retrain, save one. I now had a reproducible test, so I could try the various suggestions. Turn Packet Flood Attack Detection to Off - the theory is that activity on the router looks like a denial of service attack. Easy enough. Turn off the settings and try again. DSL Link Retrain. Move the Power Supply Brick to the Wall Outlet - theory here is that the 2Wire devices have marginal power supplies, and any reduction in voltage might cause a random glitch when the device draws power when doing something. Another easy test - replug and try again. DSL Link Retrain. Switch to 802.11b Wireless Networking - the theory here is that the 2wire devices can't internally handle the speed of 802.11g (54 Mbps) and the slower 802.11b (11 Mbps) allows the device to work correctly. Change the settings, re-do the wireless connection on the computer and try again. No DSL Link Retrain in five tries. At this point, I switched back to 802.11g, just to be sure the problem didn't just randomly go away. DSL Link Retrain. OK -- I'm not real happy about running 802.11b all the time. Not because of the internet connection, because it is only 6 Mbps/.5 Mbps anyway. No, two things bother me. First, I have other devices on the wireless network, such as iPads and iPhones, and I don't relish synching them at 11 Mbps. Second, the results from SpeedTest.NET were about 10% slower on 802.11b than on 802.11g. I did notice that the router does have a speed limit setting for 802.11g. I switched it to a limit of 12 Mbps and tried again. No DSL Link Retrain in five tries. OK -- that works. And my 10% improvement in internet speed over 802.11b is back. Good. Try limit of 24 Mbps. DSL Link Retrain. The only other setting between them is 18 Mbps so try again. No DSL Link Retrain. I've been running like this for most of a week and am pleased to say that I have suffered no further DSL Link Retrains logged by the router. It seems that high wireless speeds cause the router to reset the DSL connection. Frankly, this seems to be a product defect. It might be best to disable the wireless access point in the device and instead use a separate wireless access point connected to one of the Ethernet ports. (Unless, of course, that triggers the problem) I have not tested this. A better solution may be to replace the 2Wire equipment with something that actually works. If anyone has suggestions, let me know. In the meantime, I'll be enjoying my slower (but working) wireless internet. My 30+ year old Mini-MOS keyer, still going strong. Back in 1979, before Volunteer Examiners, FCC testing sessions were hard to find outside of major cities. My Novice license had lapsed, so I took the opportunity at the Jackson's Mill, WV hamfest and sat for the General class exam. Much to the surprise of the examiners, I passed and was soon in possession of N8BHE. One problem with this callsign on a straight key was the succession of dits. Getting all those dits out in the suffix would wear out my arm. 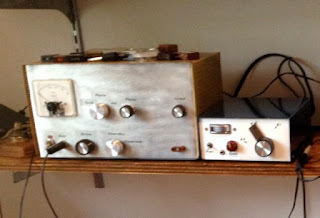 Although I tried a bit of SSB operation on my Heathkit SB-301/401 combo, my primary mode of operation was CW, and it took a while before I ventured much outside the familiar confines of the Novice bands. Since my code speed was already up to about 15 wpm, it was time to upgrade to a keyer. 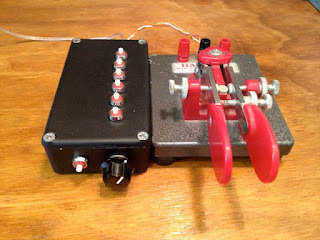 I ordered a Ham-Key HK-1 set of paddles, but I figured I could build a keyer. I remembered an article in 73 Magazine about a CMOS keyer, and there was even a followup with some improvements. The Mini-MOS keyer was still pretty new technology in 1979. Finding the CMOS parts turned out to be a challenge. My local parts stores didn't have all the exact parts, particularly the CMOS gates. However, they did have 74C equivalents. Since I didn't need the sidetone generator (my rig already had that), and the character-spacing completion circuit seemed overkill at the time, I re-designed the circuit to use the parts I could find. I did use the dual D-type flip-flop input for the paddles to keep the paddle common at chassis ground. I ended up using two 4013, two 74C02, two 74C08 an a 4020. The original 3-D wiring of the Mini-MOS. Oddly enough, I don't have a schematic for this keyer. I never drew one. Somehow, I did the re-design on the fly. The original keyer was constructed with a bit of 0.1-inch perfboard, solder-tail sockets and some 22 gauge wire. I did draw a wiring diagram that I still have. (More on this in a moment) It's amazing this thing worked at all -- those tiny bare wires so close to each other, kept from shorting out only by careful bending into a three-dimensional structure. This keyer worked great. I used it with the Heathkit SB-301/401 combo, later with a borrowed Yaesu FT-101EE, and even with a DX-60B. When I bought the Kenwood TS-430S in 1985, it was the first rig without grid-block keying, so I had to remove the keying transistor and key it directly from the CMOS gates. The CMOS chips lived up to the low power consumption -- the battery lasts for basically it's shelf-life. Over 30 years, I've probably replaced that battery eight or nine times. 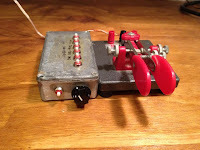 I even built one of these keyers for my brother Ben, NJ8J. For his unit, I used wire-wrap construction, rather than go through the 3-D wire sculpture routine again. This keyer worked great until last fall, when I couldn't get it to work. After a bit of troubleshooting, I concluded that the 3-D wiring had finally given up the ghost, so I decided to rebuild it using wire-wrap construction. board is held in place with two screws and spacers. I actually prefer a 3M product that uses IDC (insulation-displacement connections) over wire-wrap, but, unfortunately, this product wasn't that popular with 3M, and I don't know if you can buy it any more. Having plenty of wire-wrap sockets and tools, I pulled out the 30+ year old wiring diagram and re-created the circuitry. This process did not take more than about an hour. Plug the chips in, connect the battery, and ... it doesn't work. By now I was beginning to doubt of the 30+ year old chips were still functioning, that somehow a stray static charge had blown out one of the gates. A bit of troubleshooting shows that the master oscillator isn't oscillating. Maybe the 74C02's are bad? I put them into a protoboard and checked them out. Heh, even with no connections, the gates are oscillating at around 2 MHz. (This is why you always need to tie unused inputs to ground or Vdd). A bit of work with a few resistors and an LED proves the 74C02 works just fine. OK, why won't it oscillate? Debugging this was slow work, and I wasn't making progress -- which is why I eventually ordered the K1EL K12 Keyer board. But even after finishing the K12 Keyer, I still wanted to know what was wrong with the Mini-MOS. Several weeks later, I finally got the oscillator to go. However, the speeds were all wrong. Trying to adjust the speed range I found the oscillator would quit. A bit more work I discovered the underlying cause: my 30+ year old wiring diagram had an error in it. Yes, one of the resistors was shown connecting to the wrong junction. When the resistance got below a certain point, there wasn't enough hysteresis to trigger the oscillator and it would quit. Easily fixed by moving one wire. Oh, and, of course, I corrected the wiring diagram. The keyer works again like it always did. I hope it lasts another 30 years. I want to try it out with the 40m Novice Transmitter. 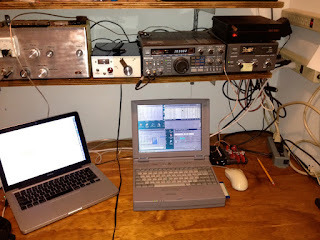 I managed to put in a pretty good effort for the Georgia QSO Party from the microshack. Managed a total of nearly 14 out of the 20 possible hours operating. Much of this was calling CQ. I was pleasantly surprised to find I could keep up a decent rate most of the time. I probably could have scored a bit higher had I not tried so hard to make Qs on every band. The station, as you can see is not elaborate. Venerable TS-430S with an AT-250 antenna tuner. Used the R7000 from 40-10m, and the 80/40m dipole for 80 and 40m. The dipole is pretty low -- only 3m high -- so it is a real worm -burner. The TS-430S does not have the QRM-fighting power of the Elecraft K2. There were a number of times someone moved in close to my running frequency and I had to slide away, because I could hear. 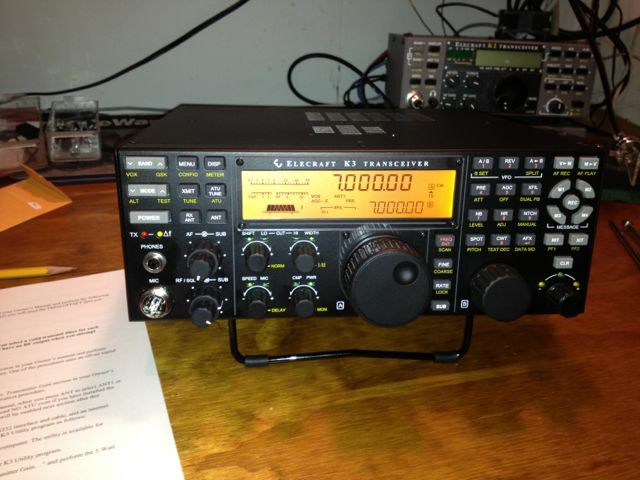 Running on CW was very effective on both 20 and 40m. Oddly, though, I could never get anything going on 20m phone. 40m was the big-time money band, with over 2/3 of the contacts taking place ont hat band. I started off using the R7000 on 40m, but I found the worm-burner dipole to be much more effective overall. It really needs to go higher. I can't wait to see how well it will work way up in the trees. Many thanks to the folks who spotted me. I could tell a few times when it happened with a flurry of callers. I did have one odd incident on Sunday around 2210z. I had been running near 7042 kHz for nearly a half hour, when suddenly I was blasted with a high-speed, run-together CW that started off OKNOMORE.... and was laced with profanity. I knew I had a problem when I moved up half a kHZ and he followed me a minute later. I switched to phone for 10 minutes then came back to CW in a different part of the band. I hope this lid did not bother anyone else. This is my best GQP score ever, with more phone Qs alone than my Phone-only efforts. Unfortunately, I don't have any pictures to share of this, but Jerry NG6R's question this week reminded me of the ordeal -- so I figured I should share it with everyone. I added the A743 to the A3S in September of 2005. The A3S had been up on the tower for four years at this point. I remember running into some difficulty with this update. Remove Rotator - rather straightforward. Loosen the rotator clamps and lever the mast up a centimeter or two before tightening down the clamping screws on the tower top. Remove the rotator clamps, screws, unhook the rotator cables (you did use a weatherproof connector for this, didn't you? ), and pull the rotator out. I think I attached a sling to the rotator and hung it off the side of the tower using a carabiner for the duration. Lower Mast and Antenna to Top of Tower - this step always makes me nervous, as I always think the 70+ lbs of mast, antenna and whatnot is going to come crashing down suddenly and impale a foot, hand or arm as I loosen clamping screws in the tower top. Remove Driven Element. First loosen the U-bolt and swing the element up vertically. I then attached a sling just above the boom and then removed the U-bolt. (This way, the element can't get away from me an go crashing to the ground) Then attach to a rope and lower to the ground. Update Driven Element with A743 Components. Be sure to follow the tips in my original article. I used the dimensions half-way between CW and MID in the manual. Double-check your dimensions. Take care to avoid bending the capacity hat. Go ahead and attach the driven element support rope clamps, and tie the rope to one clamp. You can't tie the other side, since it has to go over the boom. Mount the Driven Element. This bit was tricky. The element is much harder to haul up the tower, since you have to avoid snagging the capacity hats. Bring it up vertically and attach the U-bolt, but don't tighten it down just yet. Toss the support rope over the boom and swing the driven element up so you can climb down and tie off the support rope. (Don't forget to put the support rope through the grommet on the support mast) Rotate the driven element back down to horizontal. The Driven Element is strong enough to support itself, at least in the short term. 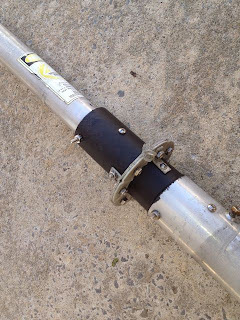 Mount the Driven Element Support Mast. Hardest bit. The amount of slack in the rope depends on where you put the support rope clamps and how long the rope is. I barely had enough slack to get the bottom U-bolt on the support mast. Once that is done you need to adjust the height of the mast to get the Driven Element level with the other elements. This is a tough operation, since you are above the tower, and have to hold the mast up with one hand and tighten the clamp with the other. Don't forget the twist in the rope. Without it, you'll be back up the tower in a year or two to replace the rope. Raise Mast and Antenna. Again a nervous operation. If your mast is heavy, you should use a come-along. Mine isn't terribly, so I used a pulley arrangement. Replace Rotator. Reverse of the previous steps. Sounds simple, doesn't it? No. Well, it took me about a half-dozen climbs to finish this off in the fall of 2005, and then I had to do it again when the support rope broken. I haven't had any trouble since then. Jerry, NG6R, e-mailed me this week in response to my posting on the Cushcraft A3S/A743. Jerry had sold his A3S to another ham who was wondering about getting the A743 add-on kit. He wanted me to share my experience with the antenna. The performance on 20/15/10 was the same as before the update. On 40m, it is a dipole -- but a rotatable dipole. Beamwidth is pretty broad, about 100 degrees. There are noticeable nulls off the ends -- and some of that may depend on how high the antenna is mounted. Mine is at 15m (50 feet) high, which is still a little bit low for a 40m antenna. If you can mount an inverted V or dipole significantly (8-15m) higher than the A3S, you might be better off with a wire antenna than the A743. At my QTH, the 15m high tower is the highest point in the lot, so the A3S/A743 is a great combination. In the picture, you can see the 80/40m trap dipole coming off horizontally to the left of the tower at the 12m level. This dipole is broadsize NE/SW. With only 3m difference in height, there's not a lot of difference in the two antennas, with the higher antenna having a slight edge on DX. During some domestic contests, I would rotate the A3S/A743 to point NE, giving me 360 degree coverage on 40m with a flick of the antenna switch. Does it work? You bet. I have 40m WAS and 113 credits on LoTW for 40m, virtually all of them on this antenna. 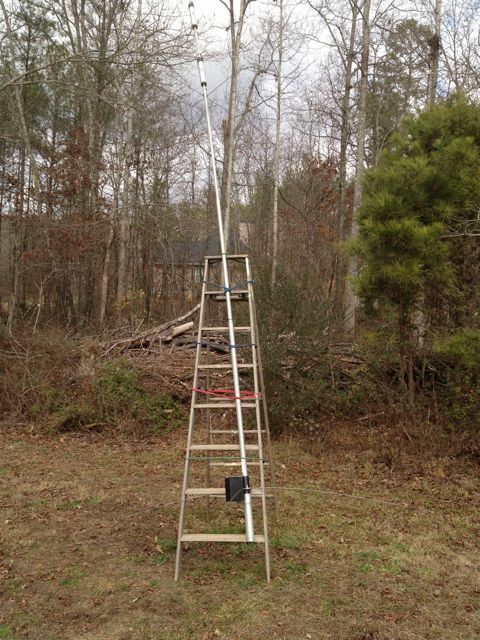 I'd prefer a two-element short 40m yagi, but my tower installation doesn't allow it. The A743 kit only adds a few pounds of weight and increases the turning radius by about a meter. It's a good addition to most A3S installations. 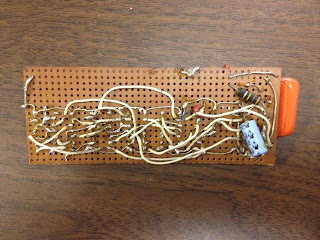 My 30+ year old CMOS Keyer gave up the ghost -- the point-to-point wiring apparently was suffering from a failure. I tried re-building it using wire-wrap, but the troubleshooting was taking too long. I figured I needed to quickly build a replacement keyer that I can use right now with my TS430S. I remembered that Curtiss used to make a keyer chip. But a quick search found that the original Curtiss devices were no longer available, although MFJ purchased the rights and offers a slightly updated chip. Honestly, at the time I looked at this, the chip was $45, which seemed way more than I wanted to spend on a "temporary" keyer. A bit more searching brought me to K1EL's web page. 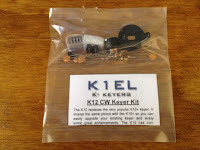 K12-BAT kit, as it comes from K1EL. K1EL offers a number of interesting devices and components. The WinKeyer I had heard of -- but frankly, the name put me off slightly, as I've been a long-time Macintosh fan. Imagine my surprise to discover there's nothing "Windows" about the WinKeyer. It looks like a superior product for providing CW keying facilities in a contest station. But that would be a project for another day. Today, I just needed a simple keyer. And I found it. The K1EL K12 keyer chip filled the bill nicely, and had 6 programmable memories and a host of other features to boot. All for less than $10! Even better, there was a kit -- only $17. I quickly ordered the K12-BAT and within the week had the package pictured above. There's not even two dozen components. 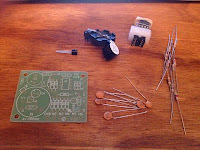 There's not a whole lot to the kit -- printed circuit board, socket and chip, transistor, battery holder, and a handful of resistors and capacitors. This would not be a bad first kit for someone. For me, it took less than 30 minutes to assemble. Once assembled, I wired up the paddles and tried it out. The command structure takes a bit of getting used to -- it's hard to remember for some of the longer commands what comes when. However, it is quite a serviceable keyer. But, I can't just have wires strewn all over the bench. (Well, actually, I can, but that's not how I like to operate) Digging through my junk box I found a used cast aluminum box that might make a decent cabinet. The hard question was -- what to use for the seven pushbutton switches I needed? Nothing I had in the junk box was small enough to fit in the aluminum box. 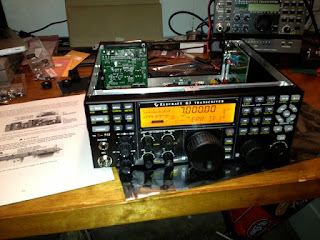 The upcoming Dalton hamfest provided the answer. If found some surplus switches that were small enough to fit, and they were cheap, so I bought eight. 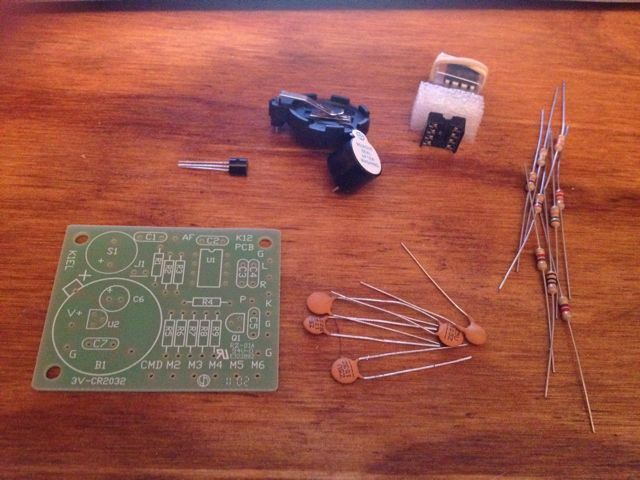 A subminiature potentiometer filled out the required parts list. Drilling out the enclosure took a more time than building the board. But the wiring was very straightforward. All done but the hard part. 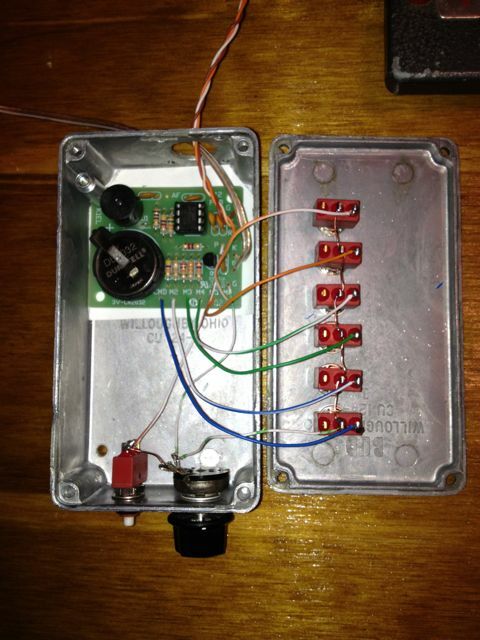 At this point, I had a functional keyer in a rather ugly enclosure. Finishing the enclosure took more effort. Removing the board switches and pot left me with an empty enclosure. You can see that it had some kind of adhesive on the top, as well as a bit of corrosion here and there. The best treatment, I've found, for stout aluminum like this is wire brushing. The oxide and other compounds come off easily, and the steel bristles of the wire wheel score the aluminum just enough to give it a nice texture. Best not to do it in a hurry and don't use too much pressure. I did both and ended up with some deep scratches in the top and a wire-brushed left index finger. Of course, I had to wire brush it again. I painted the enclosure with the same flat black paint I used to repair the R7000. The end result is pretty sweet. 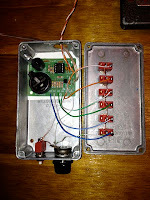 I'm still trying to figure out how to use the K1EL K12 keyer. In trying to program one of the memories, I have found it is very, very sensitive to character timing. I probably need to read the manual again. 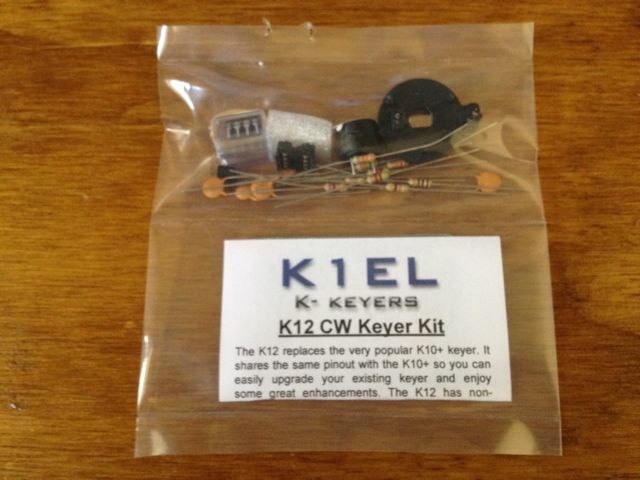 In any case, I am very happy with the K1EL K12 Keyer kit. I would highly recommend it to anyone who needs a sophisticated, yet inexpensive keyer. 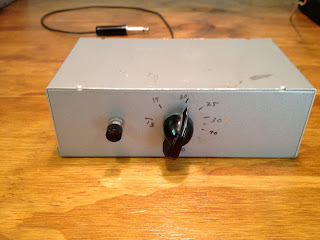 the AT-250 auto antenna tuner round out the operating bench. Yes! Straight Key Night. 2012 makes the sixth year in row I have operated this event. Once again putting the "Novice" Transmitter on the air, paired with the very capable superhet receiver. This year, I didn't have any technical problems with either the transmitter or receiver. In fact, they worked pretty much flawlessly (other than the fact that I was missing the stereo to mono adapter for the receiver and had to copy everything with one ear). The interesting thing this year is where they were. Of course, I had set this equipment up in the Micro-Shack. While not much more than a storage closet, it actually does have just enough room to set up and operate a modest amount of radio. With a little bit of help from a space heater, it was actually quite cozy during the January 1st operating event. Not much in the antenna department. I believe I favored the low 80/40m dipole rather than the R7000. As I've written before, being crystal controlled means you have to call CQ. After making a couple of contacts, I decided it would be fun to make at least one contact with every crystal in my arsenal. My ten crystals span the 40m band from 7001.25 to 7121.1 kHz. Some of the frequencies are quite popular, whereas others are pretty far away from heart of SKN activity. Oddly enough, it was the popular frequencies that were the hardest to complete -- they were almost always in use. I was successful in not only making at least one contact on 7001.25, 7006.7, 7010, 7038, 7042, 7047, 7050, 7061.1, 7075, and 7121.1 kHz, but also making one contact on 10108 kHz. I had just gotten two crystals for 30m this past Christmas, and they tuned right up in the "Novice" transmitter. Of course, the little receiver couldn't be used, so I used the TS430S for that role. Fifteen total contacts, to twelve different states: VA, MI, FL, GA, TN, TX, PA, MN, IN, AL, NY, NC. My best ever SKN outing. I spent my 44th birthday flat on my back in so much pain I could not sleep. If one has never experienced back pain, it is impossible to describe. Medicines had almost no effect. The doctor suggested physical therapy. Gradually, it helped. At the end of eight weeks, my therapist told me that I knew enough to keep the pain under control. With success of the physical therapy, my doctor did not see a need to pursue more invasive treatments. I suggested that if I lost my extra seventy extra pounds, perhaps I wouldn’t have so much pain. My doctor agreed, but when I told him I was considering Karate, he was strongly against it. He suggested Pilates instead. That conversation kept me out of the studio for two years. I continued to do the physical therapy exercises, and began to feel stronger. Almost three years after my back injury, I decided to ignore the doctor and give it a try. The three years of training to obtain a black belt seemed like forever. Most most things in life, I've been a fast learner. It was difficult for me to accept such a seemingly slow pace. In the first year, I began to understand some of the subtleties of the art. It’s not just blocking, punching and kicking, but how well one blocks punches and kicks – the correct stance, balance, body position, speed. Seemly simple exercises are actually quite difficult. And while the first one may look pretty good, but how well can you do the hundredth? Training the body this way takes time, and can’t be rushed. The repetition trains the muscles and the mind to make the motions habitually. They become second nature. When I started, I hoped to lose a few pounds, and reshape my flabby self. In the first six months, I lost 17 pounds. Since then, while I continue to reshape, I haven't lost any further weight. The mental changes surprised me. Within a few months, I found I could concentrate better -- I was able to think like I could in my early thirties. This sort of concentration is very beneficial in my line of work. For some people, a black belt signifies something dangerous. They joke that you have to register yourself at a police station as a weapon, just so your neighbors will know not to mess with you. This couldn’t be further from the truth. Martial art training does not make one more volatile. With the confidence gained through training, you become a calmer, less anxious person, ready for anything. I view the black belt as something akin to a pilot’s license. In flying, flight examiners often say that earning your Private Pilot license is the beginning of your training. The license signifies that you meet the minimum qualifications of aeronautical knowledge, piloting skills and judgment to be permitted to fly yourself and passengers. Just having the license does not signify any sort of aeronautical mastery. The true learning starts when you alone are responsible for the safe outcome of each flight. The lesson is clear: that a good pilot never stops learning. To me, the black belt shows that one has demonstrated the minimal proficiency at martial arts necessary to advance to further study. Anyone with a black belt has put in a lot of hard work. Three years of training twice a week is three hundred lessons. For some, the number may be closer to five hundred. During that time, the student honed their powers of observation. They should be able to pick up the subtle details of instruction. Black belts have shown the mental toughness to keep going even when the body wants to stop – they won’t give up. Above all, the students have shown a willingness to learn. All of these are necessary for advanced study of martial arts. This isn’t the end of training, but the beginning. Since earning my black belt in Tang Soo Do, I've continued to train, but circumstances have lead me to also train in Hap Ki Do and Tae Kwon Do. It's been four years now, and I don't see any signs that I want to stop. It isn't just part of my life, on some level, it is life itself. At our last installment, we were going to re-assemble the R7000. But, I forget to mention one other rebuild step I performed. When I took the R7000 down, the center insulator was looking green. As in slimy mildew green. Yuck. That growth was going to slowly destroy the insulator. Disassembly was the first step. I thought I might be able to separate the insulator from the aluminum tubes, and I removed the screws holding them together. With the original R7000, there are eight short screws inserted from the inside of the tubes. I'm sure they use some special jig for this, because once you remove them, you can't get them back in. That's OK, because later versions of the R7000 simply used four 2 1/2 inch 8-32 screws. Even with the screws out, I couldn't separate the insulator from the tubing. It was just too tight a fit to try and separate and risk damaging the insulator. With all the hardware out of the way, the next step was to clean the green slime off the insulator. Soap and water took care of that with a little gentle scrubbing with a sponge. The fiberglass was a little frayed on the surface, but the insulator looked practically new. To prevent a new growth of green goo, I painted the insulator with a thick layer of flat black spray paint. The photo shows the screws re-assembled. capacity hat rods from bending. 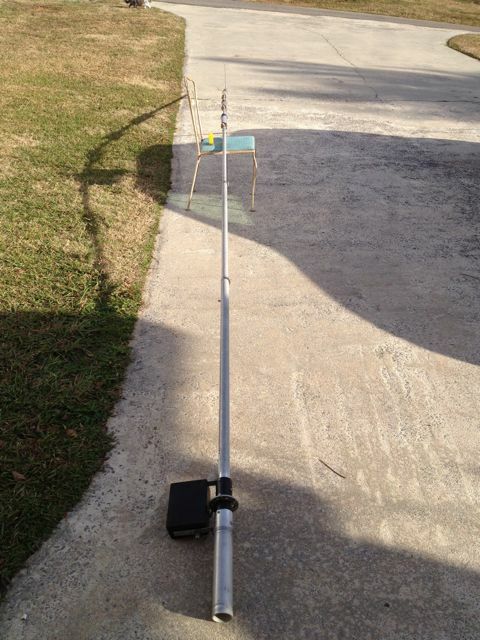 Following the measurements in the manual, I re-assembled the antenna in the driveway. Although the manual directs you to install the radial rods first, it's much easier to work with the antenna if you leave them until later. Once you put the capacity hat rods on, you'll need to elevate the antenna to keep them from bending. I used a patio chair for this purpose. After finishing the assembly, I double-checked the tubing lengths, just to be sure. This is an important step. When I first assembled my Cushcraft A3S, for example, I got the lengths on the director element about 6 inches short on each side. Before doing all the work of putting the antenna back on the mast, I wanted to make sure it was working correctly. I figured if I could hold it a foot or so off the ground, I ought to be able to see the resonance dips near each amateur band. Wooden stepladder used as a test stand. After this, I re-mounted the antenna to the mast and raised it back up in position. Initial tests seemed to show good results on 10 and 12m. 15m - 20m were a bit out of whack, and 30m and 40m were pretty much unusable. Hmm. I contemplated this problem for about a week. I figured it might be a problem with the CT1 trap. In the meantime, however, my replacement capacitor came. I replaced my chain of 4 100 pF caps with a single 27 pF 1 kV capacitor. 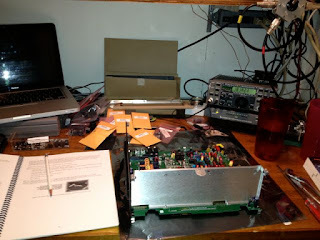 After replacing the MN7000, I was shocked to see no SWR dips at all on the antenna analyzer. However, punching the antenna with a little bit of RF remedied that. In fact, the antenna appears to be resonant on each of the expected ham bands with a reasonable SWR. I used this antenna in the recent NAQP CW. It performed decently. I even managed to hold a run for about a half hour on 40m. I'd say it's now working as designed. I don't know if it will break any pileups, but having a decent radiator on seven ham bands with one eleven foot support is nice.